The towers along the 'Khatt Shebib' don't seem to have served a military purpose: They may have been shelters from sandstorms. 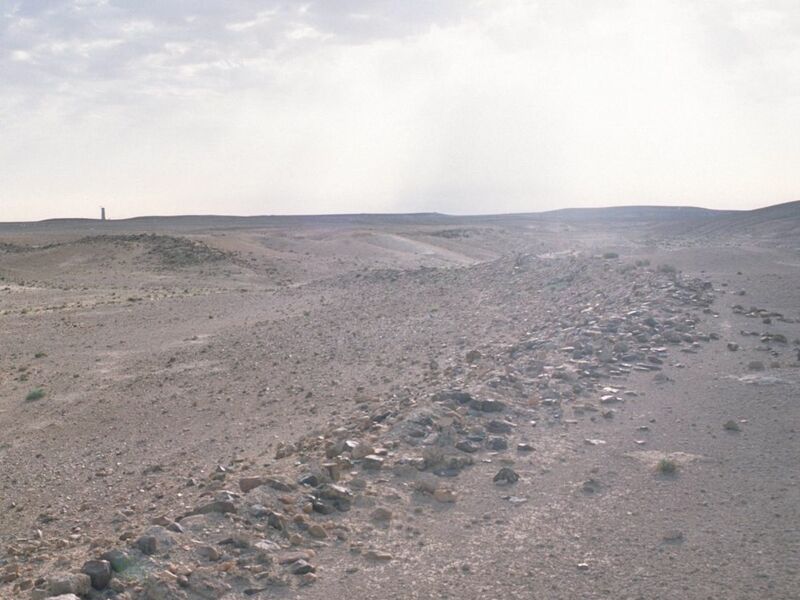 A mysterious 150-kilometer long stone wall stretching across part of southern Jordan has tentatively been dated to pre-Roman times. The wall, called Khatt Shebib by local Bedouin, was first documented by the British diplomat Sir Alec Kirkbride in 1948 as he flew across Jordan by plane. 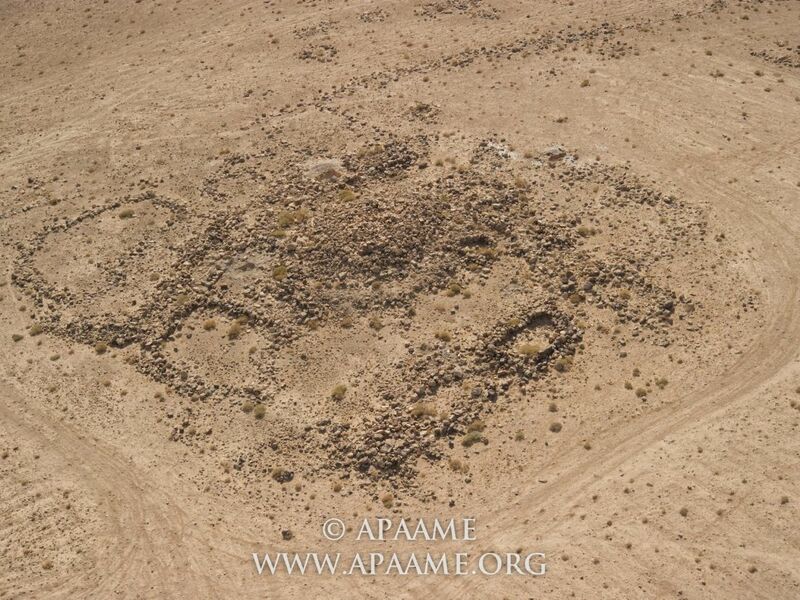 Only now that the wall has been studied in detail, using low-level oblique photography from helicopters fielded by the Aerial Photographic Archive for Archaeology in the Middle East, have its complexities come to light. Khatt Shebib actually consists of several walls, some branching off a main line, while elsewhere, double walls run side by side. Ultimately its overall length is about 150 km. “Mapping it on the ground would be a huge exercise in view of its length, and in places it has been destroyed, so old aerial photographs are especially useful,” says David Kennedy, head of the expedition and a researcher from the University of Western Australia told Haaretz. What the purpose of the vast edifice might have been still eludes scientists. The various walls comprising the Khatt Shebib are believed to have been a meter to a meter and a half in height, and made up of stones heaped one on top of the other. Given its length, building it was a massive endeavor, whenever it was done. Sir Alec and many after him assumed that the wall structures dated to Roman times, mainly because of the many Roman border fortresses lined up in its vicinity. Another archaeologist of the period, Gerald Lankester Harding, the director of the Department of Antiquities of Jordan from 1936-1956, suggested that a similar but short stretch of wall in the northern Jordanian section was a defense against cavalry. Kennedy easily dismisses the notion. “It is highly unlikely that cavalry would operate in a landscape with thick boulders everywhere,” he says, adding that in his view, the wall had not been built for defense: "It's too low and has too many gaps." That said, the Khatt Shebib could still have been the settled farmers' not entirely effectual way of fending off marauding nomads. Their raids could present a problem even for the most sophisticated military state. Further east in the desert, several forts had been constructed in the steppe to control important water points and routes from marauders. Or: “I think the best explanation is that it was a demarcation of some kind, between a region of farming and that of herding," Kennedy suggests, though there is no evidence to support the theory. Even so, he postulates that parallel stretches of walls represent "repositioning" of the boundary in keeping with changes in the local climate, for example. 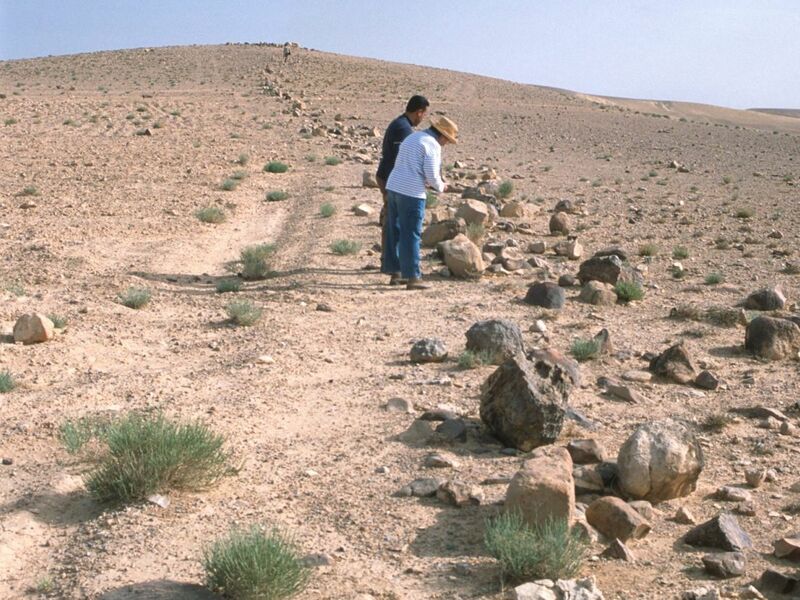 The wall could have served as a demarcation between the desert and the area in which farming was possible. The wall is dotted with hundreds of small towers, each measuring two to four meters in diameter. Kennedy suspects that some were built after the wall was constructed. In any case, though the towers could be watchtowers, Kennedy believes they did not serve a military purpose. The small towers along the wall remind him more of small shelters from sandstorms for hunters in the deep desert. Or they could have been used to store food. He admits that all these possibilities are just guesses. Since the wall was built of loose fieldstones, it is impossible to tell who first constructed it. But it was a huge effort. Even if the wall was only one meter high or so, gathering the heavy stones and constructing them into a wall was no easy task, and could be indicative of central organization, archaeologists say. It is also possible that local communities saw what their neighbors had done and imitated them. The building technique is certainly simple nough. The postulation that it was erected well before the Romans invaded the region is based on ceramic finds at some of the archaeological sites on or near the wall that pre-date the Romans. However, the pottery sherds found are too few to be clearly indicative of the period or periods the walls were in use. Fieldwork has yielded ceramics from almost all time periods. However, the ceramic evidence predominantly date to the Iron Age. The wall and towers are just one of the many enigmatic features being found in the deserts of Jordan referred by the Bedouins as "The Works of the Old Men.” Giant geoglyphs and earthworks in the shape of rings, kites, and wheels, practically invisible on the ground but clearly evident from the air, have given rise to theories – some rather wacky - but very few answers. Israel also has its share of mysterious giant works, not least the 5,000-year old, moon-shaped structure some 150 meters long just northwest of the Sea of Galilee. Pottery excavated from the crescent-shaped monument dates it to between 3050 and 2650 BCE, making it older then the Great Pyramid of Giza in Egypt. Another is the gigantic circular structure "with a diameter greater than the length of a Boeing 747" found at the bottom of the Sea of Galilee. Also made of piled stones, archaeologists have been helpless to date it, or figure out why it was built. Yet another mystery is much smaller in scale, if no less baffling to archaeologists: Mysterious stone carvings made thousands of years ago that were uncovered an excavation underneath Jerusalem.